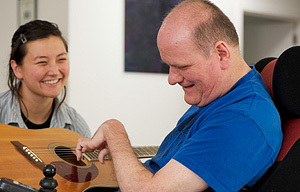 Residential Resources, Inc. (RRI) was established in 1988 to provide fully integrated, life-enhancing supports for people with developmental and acquired disabilities. Today, we operate throughout New Hampshire, Maine and New York. Founded on a philosophy that emphasizes social roles for everyone, we offer supports that assist people as they strive to live independent, meaningful lives in the community. We currently support over 300 people with developmental and acquired disabilities, including Prader-Willi Syndrome, Huntington’s disease, traumatic and acquired brain injury, autism, cerebral palsy, multiple sclerosis, and dual diagnosis. We employ over 300 Direct Support Professionals, Program Managers, Supervisors, Regional Directors, Registered Nurses, and other support staff. We pride ourselves on retaining quality staff by promoting learning, training and advancement opportunities. Our staff also consists of consulting professionals with a high level of clinical expertise in a range of areas. These professionals include Clinical Social Workers, Non-Violent Crisis Intervention Instructors, Certified Brain Injury Specialists, Mandt Trainers, and Behavioral Support Instructors. RRI subscribes to the principles of Total Quality Management (TQM) and actively strives to continuously measure, sustain, and improve the services we provide. When you employ the support of RRI, you are assured of quality, professionalism, experience, accountability, and cost-effectiveness.